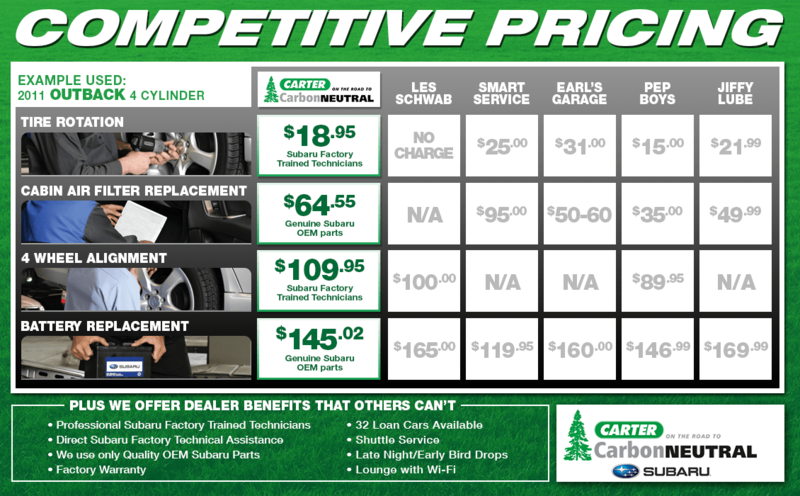 At Carter Subaru, we strive to provide the best Subaru service in the Seattle, WA area. If you're looking for incredible low prices on oil and filter changes, alignment, tire rotation, and other services, Carter Subaru Ballard is an easy choice. When you look at our dare to compare chart, it's clear how we stand apart. Our factory trained technicians perform maintenance and repairs with manufacturer recommended techniques and equipment. We also cover Subaru factory warranties and offer money saving service specials, discounts on genuine Subaru parts, and Subaru loaner vehicles. With everything we offer at Carter Subaru Ballard, the choice for dependable service and maintenance is clear. Carter Subaru Ballard serves Bellevue, Tacoma, WA, and other nearby communities with our commitment to the Hassle-Free buying experience. We're proud to offer a full range of services including our cutting edge Subaru maintenance and repair, our inventory of genuine Subaru parts and accessories, and our wide selection of new 2014 Subaru models and pre-owned vehicles. You'll find incredible savings with our service specials, parts discounts, and new car specials. You can schedule your service appointment with us at (877) 835-5240 or visit us at 5201 Leary Ave. NW, Seattle, WA 98107, not far from Tukwila, WA and Bainbridge Island, Washington.